If the National Park Service opts to go forward with a proposal to replenish the dwindling wolf population on Michigan’s Isle Royale, there’s already a basic plan spelling out how that would happen. The NPS is supposed to release its final decision on the wolf question very soon. In mid-March, it released a Final Environmental Impact Statement to Address the Presence of Wolves for the remote island park in Lake Superior. It laid out four alternatives for action related to the wolves, including Alternative B, which is the Park Service’s preferred plan. It calls for a capture of 20 to 30 wild wolves for release on the island. Federal officials find themselves on the brink of this decision after the island’s longtime wolf and moose populations have seesawed down to a spot where there are only two wolves left on the island. Disease, accidents and inbreeding all have taken a toll on a population that at its high point saw about 50 wolves on the island. Meanwhile, the island’s moose population, without a strong predator pack, was last estimated at 1,600 and accelerating. Their overbrowsing of this leafy wilderness is a real concern. The last wolf pair – a male and a female – are closely related. They have little chance of producing viable offspring, according to researchers who have been tracking the decreasing pack for years. Isle Royale sits in the northwest portion of Lake Superior. It’s about 15 miles from the Canadian border, and 56 miles from Michigan’s Upper Peninsula mainland. Wolves crossed over to the island on ice bridges in the 1940s, researches said. But any wolves that may have come over when ice bridges have formed in recent years have not stayed. Currently, the remote island in Lake Superior has 2 wolves and about 1,600 moose. 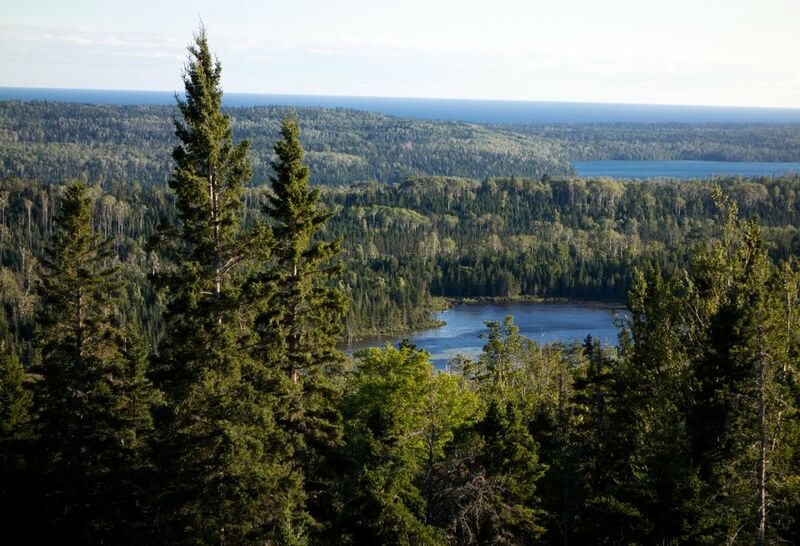 View from Isle Royale National Park’s Mount Ojibway tower. Between 20 and 30 wolves would be brought to the island in the first three years. They would be captured mostly from the Great Lakes area, in places where the plants and forests are similar to the island’s habitat, and in areas where they are currently used to hunting large prey. “Areas of the Great Lakes region where wolves would be captured could include, but are not limited to Minnesota, Wisconsin, Michigan, or Ontario, Canada,” the document says. The NPS would target healthy wolves, a mix of age and genders, and they could arrive on the island as mini-packs, parents with pups, or individuals. How would they be captured? The plan says the wolves could be nabbed with a net gun shot from a helicopter. They could use modified, padded foot traps. They could dart them from a helicopter, or use modified snares. The wolves could be “chemically immobilized” during capture, and taken to a site set up where they could be briefly examined. They would be held for just the minimum time necessary before introducing them onto specific parts of the island. The goal is not to stress the wolves, and not to habituate them to humans. The island typically draws day visitors from April through October, as well as hikers, paddlers and others who arrive for longer stays. The park is closed to visitors over the winter, and could shut down early as soon as this fall if the NPS goes forward with these plans. 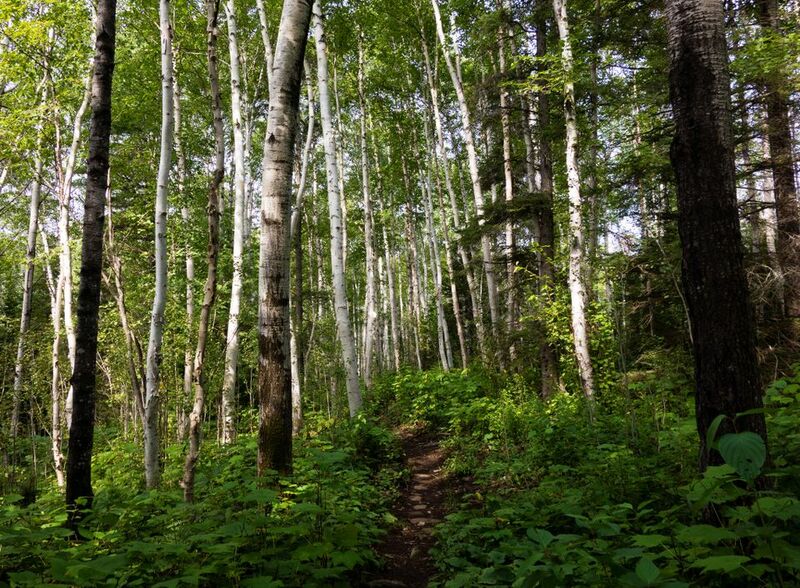 Trees along the Indian Portage Trail at Isle Royale National Park. The park service favors a “hard release” This means releasing the wolves – either alone or in groups – without using holding pens to acclimate them to the island. A little support might be offered to the newcomers. The plan says moose carcasses could be put out to encourage the new wolves to stay in certain parts of the island. Or it could keep a bonded group of wolves in one area while other releases are happening in a different part of the island. Alternative B calls for up to 30 wolves to be released in a three-year window. The end goal: create a healthy wolf population that re-establishes an apex predator on the island. If after three years there is a mass die-off of the new wolves, due to disease or another factor, wolves could be added for another two years. But this option has a door that closes firmly at the five-year mark. “No additional wolves would be brought to the island after five years from date of initial introduction,” the plan says. The proposal also talks about using telemetry collars to monitor the wolves. This would tell researchers where their den sites are, or where one has died. It would also tell them if the re-introduction method is succeeding. Of the other three alternatives spelled out in the plan, one is to do nothing and another is to take no action now, but leave the door open for wolf re-introduction later. The last option is a much longer-term plan that calls for introducing wolves now, and continuing to add them over the next 20 years as the park service deems necessary. Nearly all of Isle Royale – 132,000 acres – is designated as federal wilderness. For 60 years, researchers have been studying the island’s wolf and moose populations – the longest predator-prey study in the world, according to Michigan Tech University. The last time there was a large trap-and-release effort involving the island, it was to thin a booming moose population. That began in 1934, when a three-year experiment moved 71 moose off Isle Royale. It was the 1930s, and Michigan’s Isle Royale had a big, hairy problem. Lots of them. The U.S. National Park Service has made headlines for reintroducing wolves before, most famously at Yellowstone National Park. Between 1995 to 1997, 41 wolves from Montana and Canada were released in the park. As of early 2017, there were eleven packs established in the park, totaling nearly 110 wolves. If new wolves are brought to Isle Royale, it’s unclear whether its two current wolves would survive the influx, the plan says. But a decision is needed soon, the park service has said. “A decision is needed because the expected extirpation of wolves and the decreasing potential for immigration raises concerns about possible effects to the current Isle Royale ecosystem, including effects to both the moose population and forest/vegetation communities. “Over the past five years the wolf population has declined steeply, intensifying the need to determine these effects. Although wolves have not always been part of the Isle Royale ecosystem, they have been present for more than 65 years, and have played a key role in the ecosystem, affecting the moose population and other species during that time.